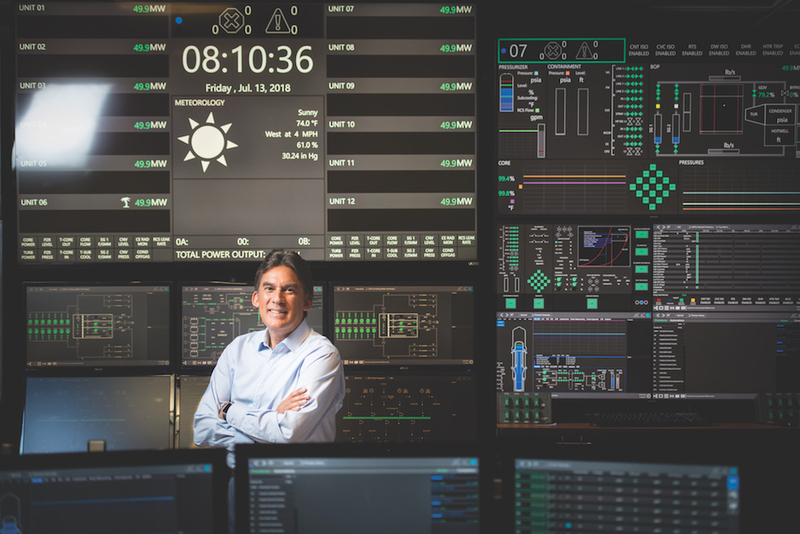 José Reyes stands in front of a virtual nuclear power plant control room with workstations that simulate the operation of a NuScale SMR module, turbine generator, and support systems used to generate electricity. As the United States embarks on a new era of investing in clean nuclear energy, José Reyes is a driving force behind a technology designed to make it better. He’s devoted 40 years to making nuclear power plants both safer and more efficient. Reyes is chief technology officer of NuScale Power, headquartered in Corvallis, Oregon, and professor emeritus of nuclear engineering at Oregon State University. 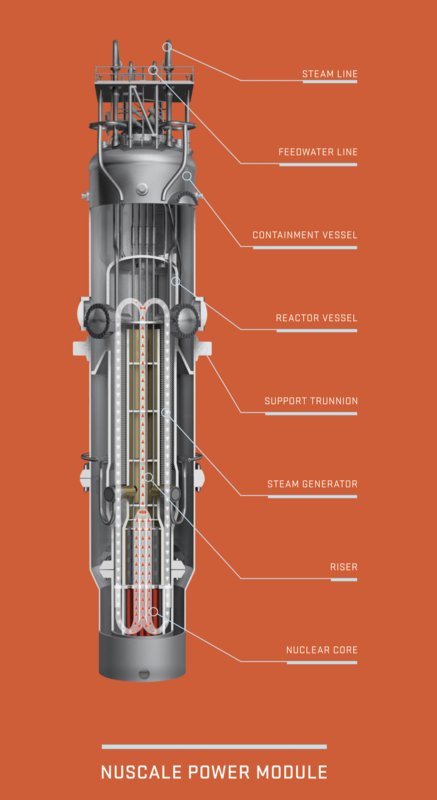 NuScale intends to become the first company to introduce Small Modular Reactor (SMR) technology to the world, and it is on schedule to do just that. NuScale filed a design certification application to the U. S. Nuclear Regulatory Commission (NRC) in December 2016, and it recently passed the first and most difficult hurdle of the approval process. The unconventional design is unlike anything status quo. SMRs are economic, factory built, shippable, scalable, and they are capable of providing power to areas with limited infrastructure or access to water. Most importantly, they provide something we must have — a reactor that cannot melt down. Reyes was born in the Hell’s Kitchen neighborhood of Manhattan in the mid-1950s and moved with his family to New Jersey when he was 2 years old. His dad, a career Navy man, moved around a lot, but the family stayed put until he was stationed in Florida in 1971. One day, while Reyes was in high school, his father brought home a bunch of books. One book in particular caught his eye — a handbook from Oak Ridge National Laboratory on nuclear energy and atoms. That’s when he knew he wanted to study nuclear engineering. Around the same time, he met his high school sweetheart, Donna, whom he would later marry. While completing his bachelor’s degree in nuclear engineering at the University of Florida-Gainesville, Reyes took a six-month internship with the NRC in Washington, D.C. Upon graduation, the NRC hired Reyes full time to work in the research office. “It was an exciting time because the NRC had a significant budget for test facilities and was actively engaged in collaborative efforts to examine the safety of nuclear power plants all over the world. My formative years as an engineer at the NRC were immersed in a culture of safety mindset. Everything that we did was focused on nuclear plant safety. That became the foundation of my engineering,” Reyes said. During that time he also got to work with some top-notch people. “There were 10 of us in the reactor research group responsible for testing. It was like the ‘Who’s Who’ list of the industry, and I was the youngest guy in the group. I learned a lot from each of them,” Reyes said. Indeed, in 1979, as the youngest engineer in the group, Reyes was among a five-person team asked to gather information for a Department of Justice investigation into the accident at Three Mile Island — the largest nuclear disaster in U.S. history. As part of that effort, he reviewed the operator log books. “Those were really important years for me in terms of understanding how nuclear power plants work, the safety of nuclear power, and how fundamental engineering relates to nuclear power,” he said. Reyes spent 10 years working full time for the NRC while simultaneously earning first a master’s, then a doctorate in nuclear engineering from the University of Maryland — all while starting a family. A view of five SMRs submerged in a large one-time-fill pool of water. The pool is housed underground in a Seismic Category 1 building designed to withstand the maximum potential earthquake or unforeseeable stress, including aircraft impact. After seeing how plants were being built and tested all over the world, Reyes decided he’d like to teach, design, and conduct his own experiments, so in 1987 he accepted a faculty position at Oregon State. Reyes was promoted to full professor in 1996 and served as the head of the College of Engineering’s Department of Nuclear Engineering and Radiation Health Physics (now the School of Nuclear Science and Engineering) from 2005 to 2010. Known for his world-class expertise in thermal hydraulics, Reyes directed the Advanced Thermal Hydraulic Research Laboratory at Oregon State. Utilizing the Advanced Plant Experimental Facility, he also led the integral system test programs conducted at Oregon State in support of the new Westinghouse AP600 and AP1000 reactor design certifications sponsored by the NRC, the U.S. Department of Energy (DOE), and Westinghouse. In 2000, the DOE introduced a new Nuclear Energy Research Initiative, looking for a range of innovative ideas and new reactor concepts. A primary focus was on safety, and in 2003, Reyes’ group conducted its first test of the small light-water reactor demonstrating the feasibility of a small containment tightly coupled with a reactor pressure vessel. “We pressurized it, then transferred all the heat — without any operator intervention — into a pool of water. It would passively cool down by itself. This was really a landmark test for us,” Reyes said. The program achieved acclaim through a $3 million donation from Henry W. Schuette (’50 B.S., Mechanical Engineering, ’01 Engineering Hall of Fame) and Janice J. Schuette in October 2003. At the time, it was the largest gift to the department in its history. The Schuettes recognized Reyes’ contribution to the research and development of the small modular reactor, and he became the first holder of the endowed Schuette Chair. After the initial MASLWR design project ended in 2004, Reyes left on sabbatical with the International Atomic Energy Agency in Vienna. While there, he met a lot of engineers from different member states and got a worldwide view of the nuclear industry. He found a tremendous need for small reactors, as many countries don’t have the capital to pay for a large, 1,000-megawatt plant, nor do they have the grid system to support a plant that size. Reyes started thinking about how to improve upon his “great little experiment back in Corvallis” — and how to move his idea from the lab to the market. Today, Oregon State’s School of Nuclear Science and Engineering is one of the top-ranked in the nation. Support from the Schuettes’ endowment gave Reyes the time needed to develop the technology that eventually led to the formation of NuScale Power. Lorenzini (’70 Ph.D., Mechanical Engineering) teamed up with Reyes from 2005 to 2007, to develop a strategy for the new company. Lorenzini eventually became its first CEO. “We made about 25 design changes to transform the 2003 MASLWR into a commercially viable NuScale product. And then, in June of 2007, we secured the intellectual property for the company, worked on a technology transfer agreement with Oregon State, and founded NuScale Power,” Reyes said. $200 million in matching federal support. “It was a great relief and showed great integrity from Fluor when the management team said, ‘We are going to make you whole again.’ They not only paid the back wages to all the employees who stayed, they enabled us to bring back most of the folks who were laid off, and compensated them for the time they weren’t getting paid. It was truly amazing that they would do that. They saw the loyalty in those 100 employees. When we opened the doors with Fluor, we had recovered 90 percent of our workforce. Everyone really believes in what we are doing,” Reyes said. Five years later, the company submitted its NuScale plant design certification application to the NRC for safety approval, a process consisting of a 12,000-page application, 2 million labor hours developing it, a $505 million investment into the design, and 800 people working on the project during the peak. The NRC completed Phase 1 of this review in April 2018 and gave NuScale the green light to move forward. Phase 1 is more rigorous than the five remaining phases combined. Along with that, the DOE awarded NuScale a $40 million cost-shared, financial assistance award to help with development costs. Today, NuScale has 450 employees with six offices in the United States and one in London. Instead of the giant dome shaped concrete containment structures that come to mind when you think of nuclear reactors, picture a steel reactor sitting inside a giant steel thermos bottle submerged in water and below ground level. A single NuScale nuclear power module is 76 feet tall and 15 feet in diameter. Each module produces 60 megawatts of electricity, generating enough energy on average to power 55,000 homes. A NuScale power plant can house up to 12 of these modules, for an output total of 720 megawatts, which would produce enough energy to power 660,000 homes — about the size of Portland, Oregon. The refueling process is also streamlined. Only one module is taken off the grid at a time, thus maximizing efficiency, because an in-house crew can be trained to both operate and maintain the plant. A conventional plant requires roughly 800 people to perform maintenance and refueling and is typically shut down for 30–45 days. A single NuScale nuclear power module is 76 feet tall and 15 feet in diameter. Each module produces 60 megawatts of electricity, generating enough energy on average to power 55,000 homes. Most reactors use massive amounts of water and require a replenishing, external water source. The SMRs sit in a large, one-time-fill pool of water, which serves as the ultimate heat sink. The pool is housed in a Seismic Category 1 building designed to withstand the maximum potential earthquake, tsunami, or any other unforeseeable stress, including a commercial aircraft impact. NuScale reactors can safely shut down and cool themselves for an indefinite period of time without the need for computer or human intervention. They do not require AC/DC power, additional water, or connection to the main grid. A key feature of the NuScale design is that it employs a defensive security protocol using non-microprocessor systems, field-programmable gate array (FPGA) technology, which don’t use software and are not vulnerable to internet cyberattacks. NuScale plans to have its first plant operational by 2026 — a deadline set by the customer: Utah Associated Municipal Power Systems. The plant will be located on land at Idaho National Laboratory and will eventually hold 12 factory-built reactor modules. NuScale’s 10-year research partnership with Oregon State will continue as it moves through the review process — which will require more testing and verification of NuScale’s design — and then on to production. NuScale has 360 patents either granted or pending in 20 countries. 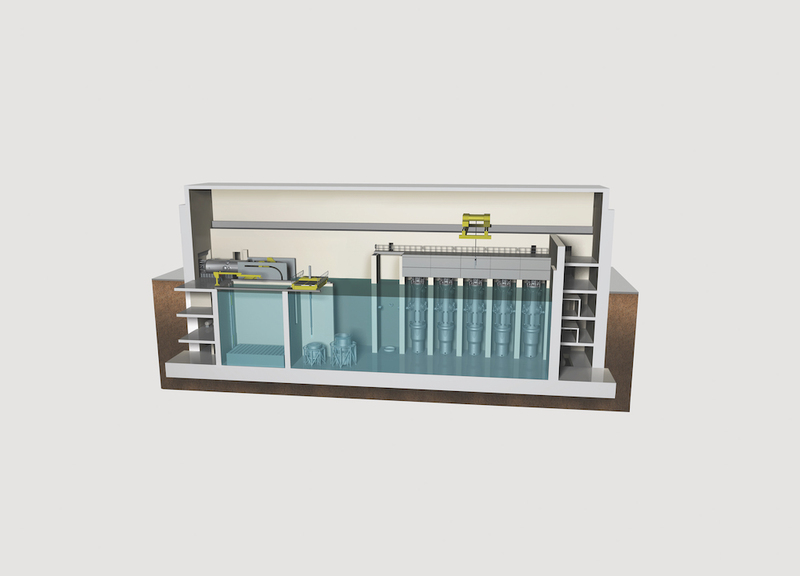 NuScale is looking at ways to use the SMRs to clean water and produce hydrogen. Access to abundant, clean drinking water is a growing worldwide concern. A city without clean water creates serious problems — cities like Cape Town, South Africa, that are experiencing a severe drought. “We also conducted a study with Idaho National Laboratory using our modules to produce hydrogen; a six-module plant could produce about 240 metric tons of hydrogen per day that can be used for a wide range of processes — the big one being energy storage,” Reyes said. Other applications include helping industry reduce greenhouse gases and air pollution — such as in oil refineries — and supporting zero-emission electric cars. NuScale plans to help existing facilities reduce emissions and also to support load-follow solar and wind farms. “There are lots of ways our technology can impact people, planet, and prosperity. We want to improve the lives of people around the world. The only way to do that is through clean water and clean power. Our mission really resonates with our employees. They are 100 percent behind it,” Reyes said. Although NuScale’s first customer is in the United States, the company anticipates the global demand for its product will have a positive economic impact on the country and will bring many new jobs to Oregon. NuScale already supports more than 400 families in Oregon, all working toward the goal of producing clean energy to power a brighter future for the world.